Hundreds of thousands of people from a corner of eastern Europe were forcibly deported as political exiles during two waves of Soviet repression in the 1940s. Many of them died during the journey or in exile. Others returned home with shattered lives. Only a few survive today. “Those Who Remain” tells their stories. The Stalinist regime devised the deportation program to identify and exile political dissidents from what is now the Republic of Moldova. Those selected, often for reasons having nothing to do with politics, were killed or exiled with their families to remote regions of Kazakhstan and Siberia. Those who survived had to wait years to be liberated. If they managed to return home, they were systematically silenced and shamed by the Soviet and post-Soviet societies. Only recently, long after most of them died, have they been free to speak publicly about their ordeals. “Those Who Remain” gives voice to these former deportees, and to their children and grandchildren and bears witness to a profoundly important historical event that is little known by the rest of the world, as well as to the lives and deaths of the deportees who lived through it. These survivors have been waiting decades to tell their stories, which are shocking and harrowing, but also inspiring. See their faces. Listen to their voices. Some are still with us, those who remain. Sute de mii de oameni dintr-un colț al Europei de est au fost deportați cu forța, fiind considerați drept exilați politici, de-a lungul celor două valuri de represiune sovietică din anii '40. Mulți dintre ei au murit pe drum ori în timpul exilului. Alții s-au întors acasă, cursul vieții lor frânt pentru totdeauna. Doar câțiva mai trăiesc și astăzi. Proiectul "Cei care au rămas" spune povestea lor. Regimul stalinist a conceput programul de deportări drept un mijloc de a identifica și exila disidenții politici din țara cunoscută astăzi ca Republica Moldova. Cei selectați, uneori pe motive care nu aveau nimic de-a face cu politica, au fost omorâți ori exilați împreună cu familiile lor în regiuni izolate din Siberia și Kazahstan. Cei care au supraviețuit au fost nevoiți să aștepte ani buni să fie eliberați. Cei care au reușit să se întoarcă acasă au fost umiliți și reduși la tăcere în mod sistematic de către societățile sovietice și post-sovietice. Abia de curând, cu mult după ce majoritatea dintre ei au murit, le-a fost îngăduit să vorbească liber despre caznele îndurate. Proiectul "Cei care au rămas" oferă o voce foștilor deportați, copiilor și nepoților lor. Reprezintă dovada unui eveniment istoric de o importanță considerabilă, prea puțin cunoscut de restul lumii. Acești supraviețuitori au așteptat zeci de ani ca să-și spună poveștile, povești care sunt șocante și cutremurătoare, dar și pline de speranță. Priviți-le chipul! Ascultați-le glasul! Unii se află încă printre noi, cei care au rămas. Across the former Soviet Union, millions of people were forcibly deported over the course of decades to the Eastern Soviet States of Kazakhstan and Siberia. This event is one of the longest and deadliest government campaigns in history. In Moldova, hundreds of thousands of people were deported, from 1939 to the early 1950’s. The wave of deportations targeted intellectuals, large landowners, dissidents and, at times, regular people who had done nothing to provoke attack. The deportees were deemed “Enemies of the People”, had their land and homes taken from them and redistributed to the Soviet state and were systematically shamed and silenced over the course of decades. Only recently has Moldova been willing to listen to the stories of deportees and try to understand the dark history of their country. This is the only view to the outside world Pasha usually receives from day to day. Occasionally, she will stand and wave to me from her small window as I go about my daily life. “Now, I want nothing else than to be able to walk, as I used to be able to. So help me God, even as there are other people who cannot even raise from their beds!” Says Pasha. Ana is the pillar of strength of her home. Always busy, she rarely takes a moment to sit and rest. As I have gotten to know her better it becomes clear how she uses her work as a means to survive her past. The moment she stops working, the memory flood in and, at times, a quiet melancholy will cross her face. 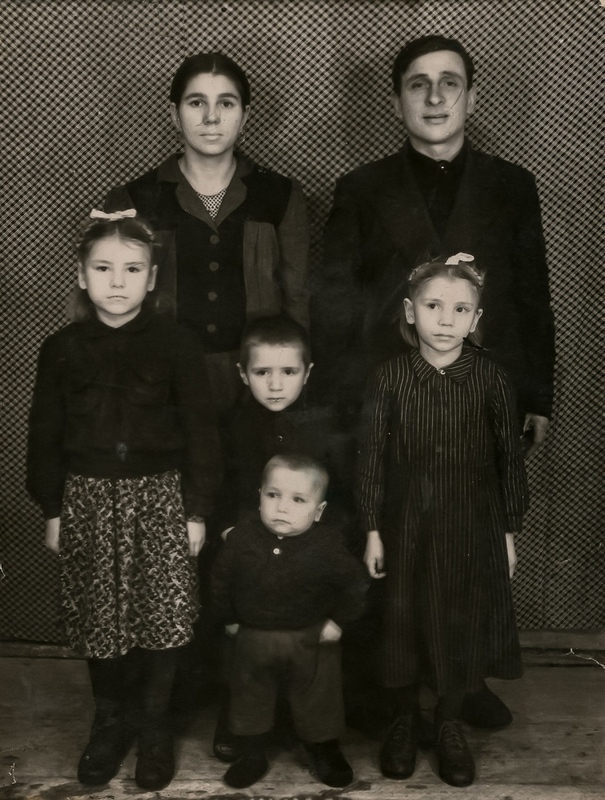 We try to recover a lost image of Ana and Pasha with their family and their father, Nichifor, who fled the Soviets. Nichifor was considered a dissident due to his and his brother’s (a local mayor in Moldova) staunch opposition to the Bolsheviks. The details of what happened to their father after they were deported are hazy for Ana and Pasha. 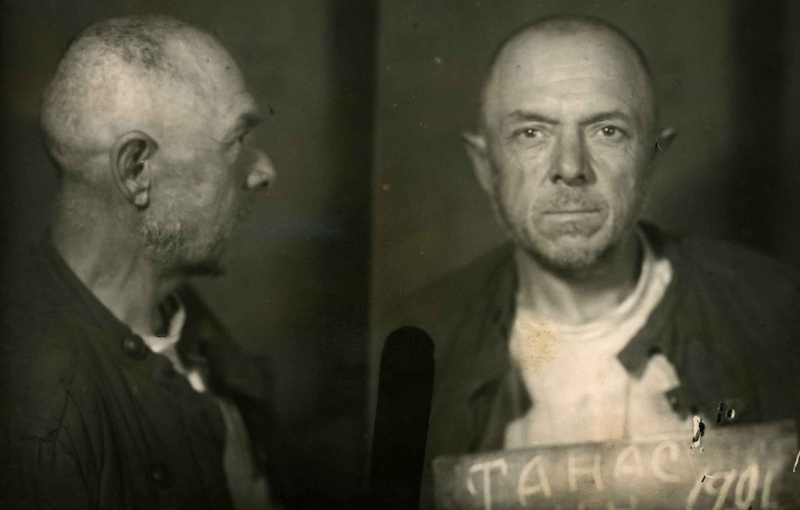 They only know that he was captured in Romania and sent to a gulag near Odessa. He died in prison of unknown causes. This photo was taken before the family was deported and the original image has been lost. Ana remembers the night their father fled, "One night, around midnight, our father, before fleeing to Romania, knocked on the window and gave us a box of sweets, saying to us, 'Your father is going away alone, I don’t know where, but you must listen to your mother because she is staying behind to raise you.'" They never saw him again. The two Russians went out looking for my mother, and Aunt Ilena went quickly into the house and pushed aside the bundles from the front of the oven and pulled out my mother, who was more dead than alive. All day my mother stayed at Aunt Ilene’s house, but that night she returned home and told us what happened. I can never forget when old Petrea Sochirca (another neighbor), with a wooden leg, came and knocked on the door at midnight and told my mother, 'Marusca, run! They are coming after you!' My mother jumped the fence and hid in Petrea’s cornfields until morning, escaping this time." Ana shows me her right hand on Christmas eve of 2015. It is important to note that during (and as part of) the deportations, the Soviet Union manufactured devastating famines across Moldova and other Soviet republics, as a way to feed the Soviet machine. The famines killed thousands of people in Moldova, squelched resistance and were commonly used as propaganda to support the deportations. 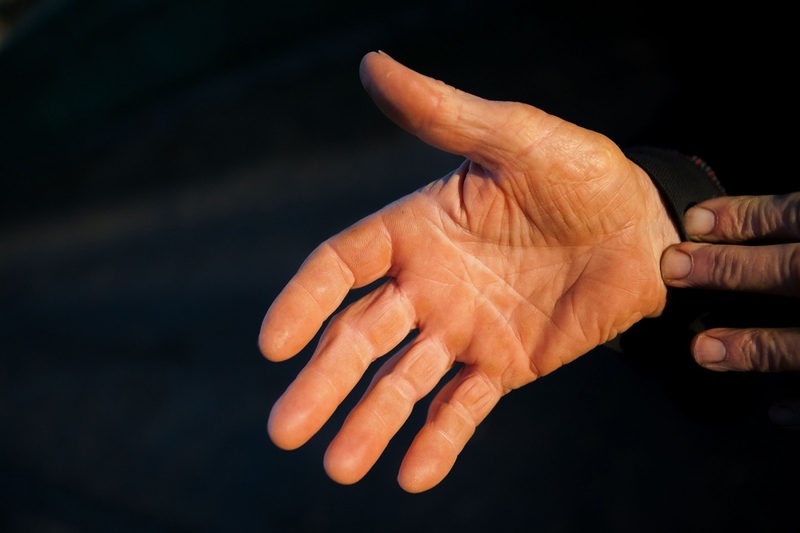 As a child, Ana severely injured her hand during the manufactured famine of 1946, which struck her village before she, her sisters and her mother were deported to Kazakhstan. Ana recalls, "The bowl broke and I fell with my little hand right into the shards. My finger was almost cut off forever. Blood flowed badly and I, with my left hand, gathered the nettle (the food she was carrying) from the floor and we ate it, dust and all. My mother ran, and soaked a rag at the stove, hugged me and bound my little hand and finger, which was ready to fall off. I fell asleep for a little while in her arms, but the pain never left me that night nor for a few days and nights after." Pasha's Song from Clary Estes on Vimeo. While on the train to Kazakhstan a young woman sung a melancholy song in Russian. Pasha remembers that song decades later. 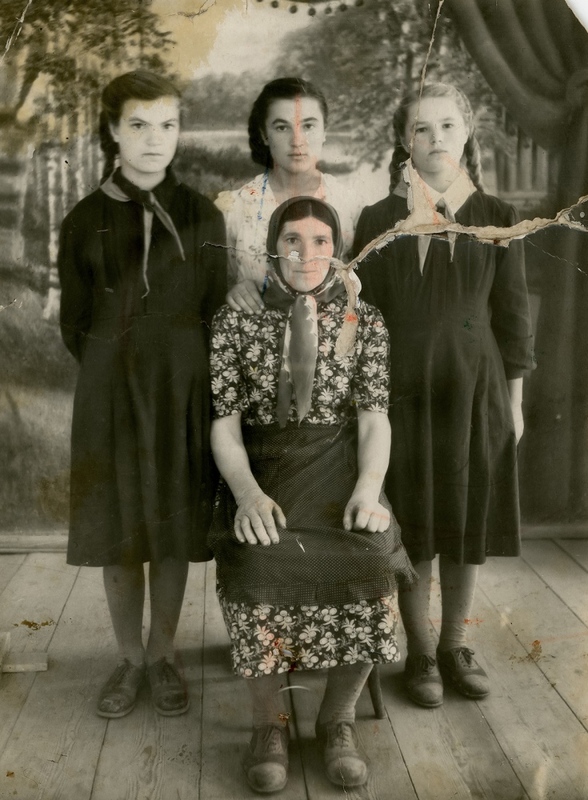 When the Graur women were deported to “Crasnai Octeabri, Kazakhstan,” Ana, Pasha and Maria with their mother, Maruşca, sitting in front of them, had a family portrait made, a common practice at the time. 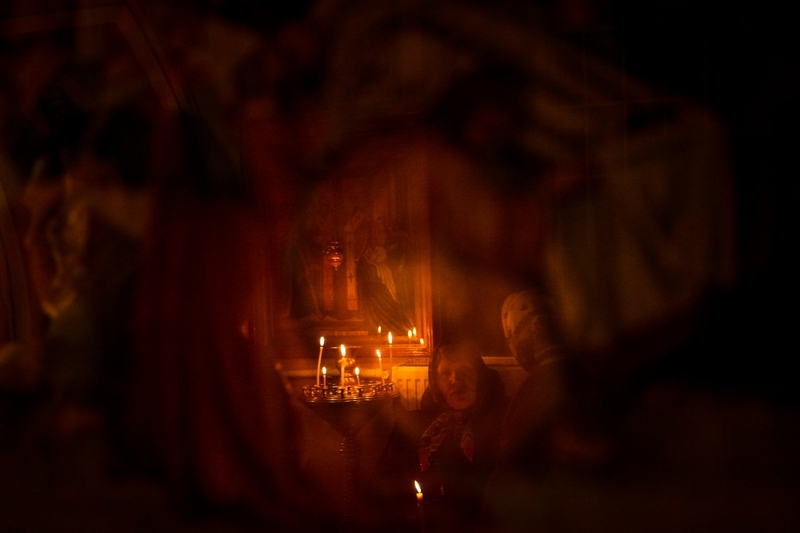 Over the Orthodox Christmas holiday, or ‘Old Christmas’ as it is sometimes called, the local priest travels to each home in the village and blesses the residents. Pasha cries and kisses the priest’s hand as he gives her a blessing. She gets very emotional when he visits, not only because she can realize her religious needs (which she cannot do socially due to her disability), but also because he is a relative of the family and she is happy to see him. Pasha is frequently moved to tears when she finally sees someone who has been away for a long time. Ana and Pasha’s elder brother, Andrei (pictured with their sister, Nadia and his wife, Alexandra) was not deported to Kazakhstan with his mother and sisters. Instead he was left in Moldova with the eldest sister, Nadia (left-most woman in the image), who escaped deportation because she was married and was considered to be a part of another family. Andrei was a shepherd by trade for most of his life and was in the fields tending his sheep at the time of his family’s deportation. Andrei was later forced to join the Soviet army, “Our brother had been taken in the army. It wasn't right, to take our brother in the army… and leave us behind. But no one cared…” says Pasha. Forced conscription has been a common practice in the region, especially under the soviet regime. At one point during our conversation about Andrei and his time in the military, Pasha, a normally calm personality, was thrown into a rage and screamed about the injustice of Stalin and the pain he spread across the country and her family. Ana and I practiced spelling in Cyrillic on the foggy kitchen window. When she and her sisters were deported to Kazakhstan they had to study in Russian. It is a common theme in deportees' stories that they learned and studied in Russian; many deportees have voiced feeling like their language was taken from them. Some older Moldovans speak Romanian while writing the language in the Cyrillic script.Other deportees lost their native tongue all together and have a hard time speaking in Romanian at all, instead defaulting to Russian. While Ana’s Romanian is quite developed, Pasha struggles slightly more as a result of her living a great deal of her adult life with her husband, Vanea, in Ukraine. Many deportees, having found a new willingness on the part of Moldovan citizens to hear their stories, have taken to writing down the details of their life for future generations to read. Here is an excerpt of Pasha's writings about her deportation, starting from her birth until her life in Vadeni with her sisters. She writes in the Romanian language using the Cyrillic script, a common tendency in the older Moldovan generations. In fact, many of the old Soviet era books still sitting on library shelves in rural villages are Cyrillic written Romanian books and are quickly becoming obsolete as the younger generations are choosing either Romanian books written in the Latin alphabet or Russian books written in Cyrillic. I was born in Vadeni village, Soroca raion in 1938 on May 16. 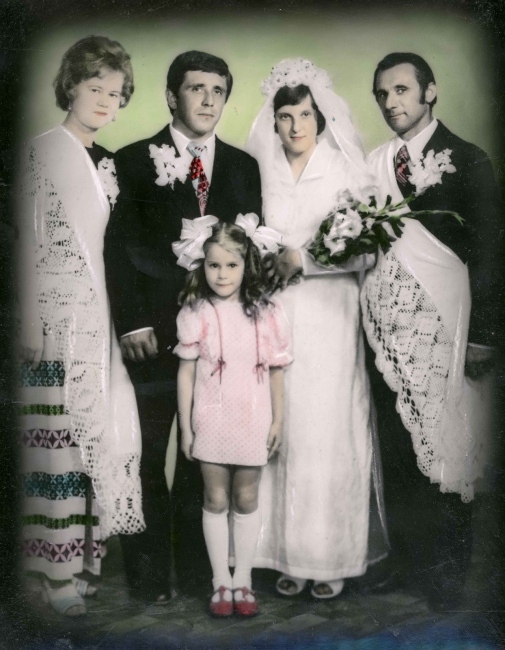 My mother had 5 children: Nadejda, Parascovia, Andrei, Maria, and Ana. We had a joyful childhood; we were happy. We played and sometimes we would [even be a bit naughty]. [For example, once,] my neighbor and I opened the basement and we saw a [full honey pot]. We took pickled cucumbers and [dipped them in the honey and ate them]. We forgot to close the lead on the pot because our [mothers] were looking for us. When they found us we were [covered in honey] from top to bottom. When my [mother] saw us she [quickly] took us to the shower and changed our clothes. threw away [the bread that was so precious to us]. Crying we [arrived in] Soroca where we stayed in prison several days and later they took us [in a car, which in those days we called] “black ravens” to [the town of] Floresti. From there they put us on [an animal transport train car], [filled with other people]. The [children had no] water, food or toilets. It was very dirty there. They took us to Odessa and later to Moscow. [The children were separated] [from the adults] and [they] would give us white bread. I felt pity for my mother and I would take [my] bread to her. Every day they would take us [out during] our “walk” time. I am tired of everyone and of this life. From Moscow they sent us to the Cuibisev, Dmalbul village in Kazahstan, in the Ottar Krasnoiarschii raion, “Krasnii Okteabri”. The trip there was terrifying and everyone would cry. We traveled for two months and the commander [who transported] us had to sign a document [stating we had arrived]. My mother would say every day, “He is a good man and [he notes who the] bad and good people [are].” The good people didn’t come from Stalin or from Moscow and it was not them who took our house and sent us far away. But they, Luca, Vasilii V and I, [bear witness to the] [memory of our parents]. [After we arrived to Kazakhstan] we started attending to a new school where we didn’t know anyone. But the director [was very kind to us]; she gave us books for free, but we [held were back a grade] because we didn’t know any Russian, however we became accustomed to [our new situation]. I had to walk 3.4 km [to attend the new school], [which] was [made more difficult because] I needed to help my mother [take care of our house]. In Soroca, she [had procured two] pigs to [ensure we could have] food and clothes. Because I was the oldest I would help her [feed the] animals. [After caring for the animals, when I arrived to our house] I would [be] frozen because I had to walk in rubber boots, [wearing only] a skirt. It was hard to get warm again because our house didn’t have heating. One day, as I was walking to school and I fell down on the side of road. Some strangers found me and took me to the hospital and I had a surgery because I had appendicitis. The interns operated on me because the doctors were gone. The surgery went well, but not that well. I came home and [the next day] was the holiday Duminica Mare (Holy Sunday) and I wanted to help my mother and be praised for having cleaned the house. I started cleaning and grabbed a heavy bucket full of water and [my stiches] broke and they took me back to the hospital where they [had to] sew me back together; [I was in] a great deal of pain. Not much time passed [after the surgery] and the doctors suggested I return to my country, Moldova, [where there was] better weather. I was able to leave with the help of my director and the classmates. They gave me money [for the journey] and I am grateful to them for that. I [arrived in Floresti at] my sister Nadia’s place [where she and her husband were renting a house and working] at the [local] tobacco factory. I went to school until the 9th grade, but my happiness didn’t last because I started hearing rumors [that Nadia’s husband did not want me to stay with them] and so I started looking for a job. I got a job with the milk factory in Floresti [where I worked] in the lab. our small house I was so sad. I went walking to the town of Soroca to request for a house for us, but the local authorities never responded to my request. There was no bus running [between Soroca and Vadeni] so we walked down the hill from the neighboring village of Dumbraveni. A car stopped and told me to get in because they were going in the same direction. I stared at him and recognized [that it was] Vanea from Alexandrovka village [where I had lived while working at the milk factory]. Our friendship started when I was 19. I was ashamed to show [him] where I was living, but he learned about it without me telling him. From that day, we started dating and on June 11, 1957 we got married [and I never regretted it]. I have [so much love and respect for my] husband. four girls. Everyone respected our mother because she was hardworking. Our dowry was stolen by the enemy (the Bolsheviks). [My son,] Vitalie, when to school, studied well, and when he was in 3rd grade he went to the school in the village of Frumusica. But [at the time] Leonid was in 1st grade and told me, “I want to go with my brother.” So every morning I would send them together to school. I would [give them a pot of warm ash] so that they could walk without [trouble in the winter]. In the village, the school [only provided classes] until the 4th grade. I loved to go to school and [and listen to the teachers]. The director, Mihail D., was happy when parents came. I was on the parent’s committee at the school, so I was at the school very often. I was happy to make [my son’s] food - something good, a “surprise”. [My sons] never lacked clothes, bikes, or soccer balls. Vitalie played the accordion. [As time passed, Vanea and I realized that we] needed to build our house. “Small children don’t let you sleep, but the old ones don’t give you a chance to live in peace.” I thought – “What is he talking about?” But this is life. Vitalie joined the military [and was stationed] in the town of Leningrad. I went to see him, but I could not recognize him. All of [the young soldiers] were so handsome. He was transferred to Murmansk with the marines. He wanted to be a marine. Leonid was in the sports department of the army in Odessa. He served in the same place his grandfather, Alexei, and his Father did. So, Odessa was like a home to us. Guests from Ukraine came and saw how well he was playing soccer and took him to Hmelniki. After the military, Vitalie started working as a driver, just like his father. He got married. We had a beautiful wedding. The years passed, [but eventually a mournful period] came for us. Our dear mother died, with her hardworking hands, feet [that never rested, and hands] that raised the five of us [children] by herself. For us she remained young and beautiful. May she rest in peace. God made it so that we lost our parents-in-law and our cousin, Vera. So instead of celebrating on Duminica Mare we [mourned]. It was painful and sad because our [son] Vitalie died at the age of 45. Four years later our son Leonid took us to stay with him in Ukraine where we lived for 6 years. At this time our sister, Nadejda [spelled Nadia elsewhere], died, as well as our brother, Andrei. Such a sad time it was for us. It was hard to say goodbye to our loved ones. And on April 4, 1993 my husband, Vaniusa, dies. [He was] all that I had left good and close to me; [he was] kind, patient, and hard working; he worked as a driver for 42 years. It is hard [for me] to forget [that I am] alone, [I have pain in my legs]. My heart and bones hurt. 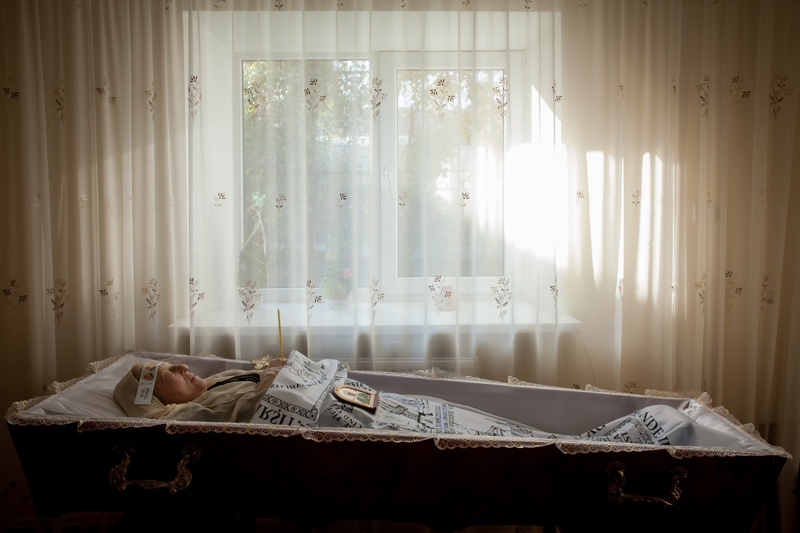 [After my husband’s death] I was forced to write to my sister, Ana, to take me to Moldova. Thank you to my family for taking me in. With Ludmila and Alexei I have a good relationship and I thank them for their care. 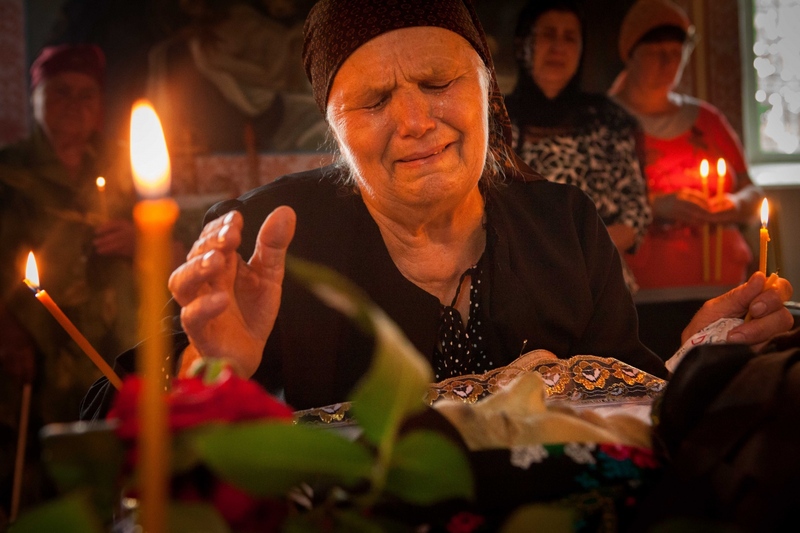 Because of the pain [when I wrote to ask for their help] I didn’t realize that I was writing in Russian; [I can’t] thank them enough, but the Holy God sees everything and I pray that he keeps them safe. All of their children: Pavel, Ioana, and [my son] Leonid. [I hope that they gain] happiness from [their own children], [are] healthy, happy and [have their] peace on earth. Please live in peace with each other. 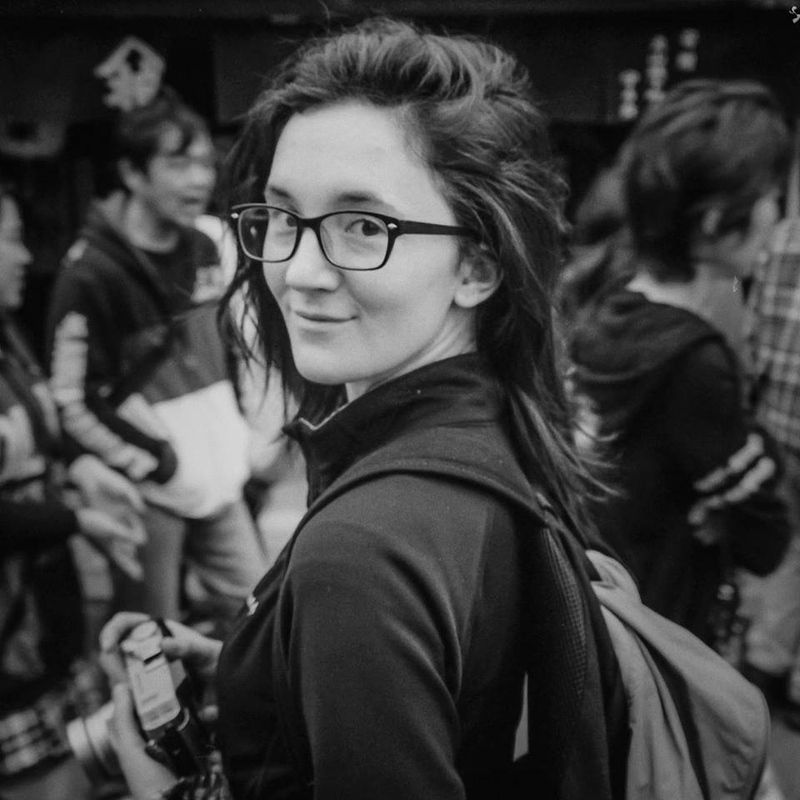 I wrote a little bit about my memories [explaining] the pain that we went through in Kazahstan, but I [I have another particular memory from] 1956. I came to Vadeni village to see my brother, Andrei. At the cross [at the head of the village] I bowed and said good morning to people [as I walked through town] and a man asked, “Who she is?” [A local official] responded, “She is the daughter of Nichifor Graur. I sent them away, never to return, but the devil came back.” I was sad, but my brother Andrei hugged me and said, “Leave it, you will not eat his bread. Luca Sochirca, we have our bread." Pasha suffered liver failure in the summer of 2017, most likely a result of a hepatitis infection, and was very jaundiced for the last month of her life. Unfortunately she was not given pain medication and her illness was a long and painful road we walked together. I cared for her a great deal during this time, often sitting with her for days on end to insure that she had enough water and medical attention. Here Pasha is clutching a branch of leaves that Ana brought in to help Pasha cool down. Moldova is very hot in the summer and there is no air conditioning in the village. Most Moldovans do not even use a fan for fear of something they call, "the current," which is the belief that a breeze will make you sick. Ana thought Pasha could fan herself with the leaves, unfortunately by that time, Pasha was too weak to do so and in her weakened and delirious state she simply clung them to her chest. Ana climbs through the village of Vadeni as she traces the steps of her childhood in the village before she was deported. Ana remembers, "The road back home was easier. From Kazakhstan to Floreşti we traveled in boxcars, and now with our naked eyes we could see the reality. We were going home and we were wondering, would we really return to the house we had, where would we find shelter? When we crossed the Nistru (the river that creates the eastern most border of Moldova), I was so excited that my eyes welled up with tears and stayed that way until we reached the village. Our pain was great when we learned that our house was now a primary school. Where were we going to go? Who will accommodate us? 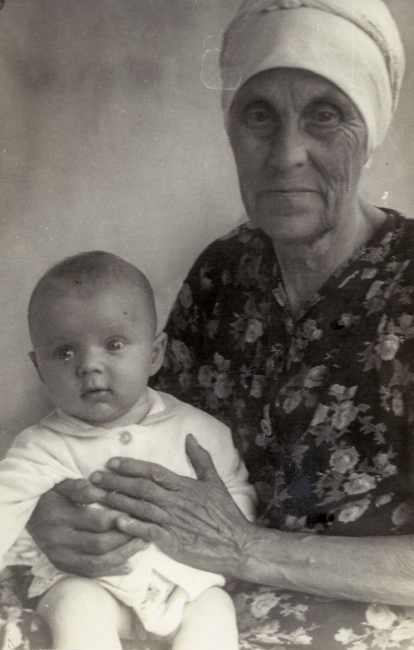 Mother met with the Soviet Committee president, Comrade Sochircă, who said, ‘Maruşcă, I thought that from where you were taken to you would not return, but you came back with children and all. The house is no longer yours, it belongs to the state.’ Mother replied that God is great and He took care of us, helping us to return home. We stayed with our biggest sister, who took us all in. At school, we were received with understanding and compassion. Tears would fill our eyes as we were passing by our old house and watching as the village children played in the front yard. People who bought things from our house would not give them back (Ana and Pasha's childhood home was taken by the Soviet state and all of their goods sold off to people in the village). 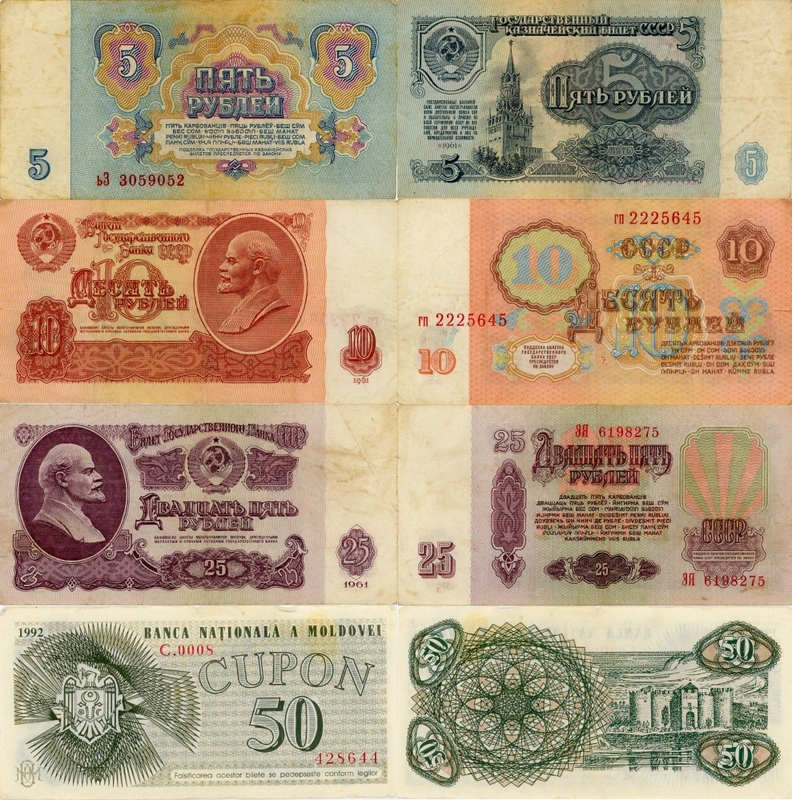 Only a woman, Anastasia Boj, came to mother and said, ‘Maruşca, I gave three rubles for your sofa. You have marriageable daughters, I will return the sofa to you.’ My mother wept and tearfully thanked her very much." When the Graur women returned, they had to work hard to get by and survive the winters, occasionally being oppressed by their own neighbors. One December afternoon Ana and I went to her mother's gravesite to visit at my request. On the way there, Ana joked that she was calling her mother to tell her she was coming. "Mama? Mama? Can you hear me?" She said into her hand, "We are coming to visit OK? I am coming with [Clary]." I smiled as we walked arm in arm. 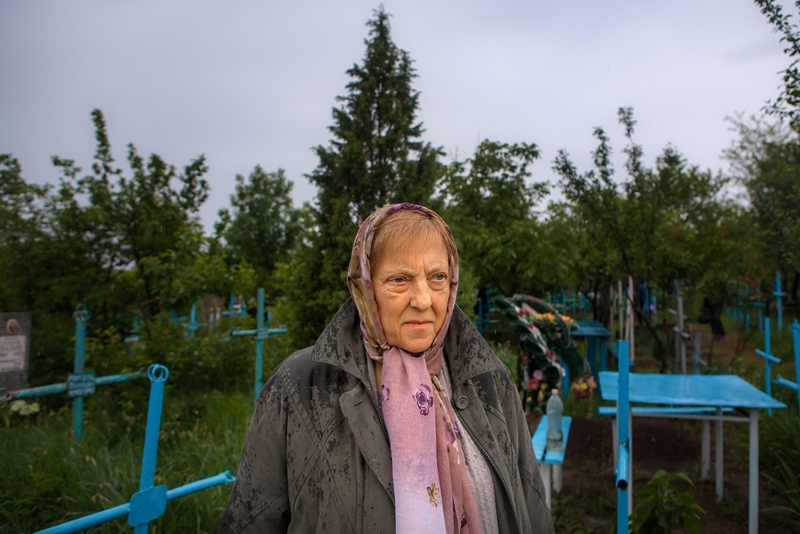 When we arrived and Ana stepped closer to her mother's grave she began to cry, "Mother I am here." She kept saying, "I am here, mother. I have come." As we leave she laid to small sweet cookies on the gravestone. "These are for my mother," she says, "but the birds will eat them for her." Ana's granddaughter, Natasia, poses for a picture years after her grandmother returned to Moldova from Kazakhstan. She now lives in Italy with her mother, Ana's daughter Lidia, and father. Out migration is a big issue in Moldova as many working age people leave the country for better opportunities to study and make money. As a result, Moldova has a shrinking population, rather than a growing one. 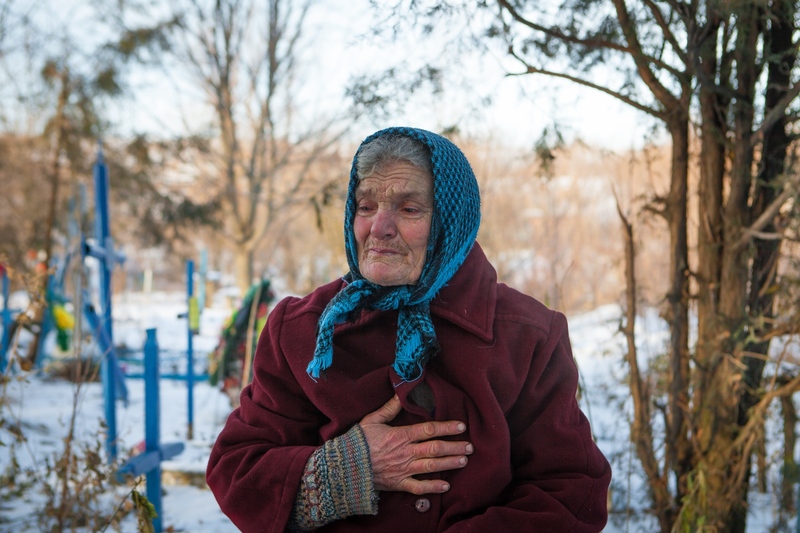 Ana came back to Moldova with her mother 5 years after they were deported, after the death of Stalin in 1956. 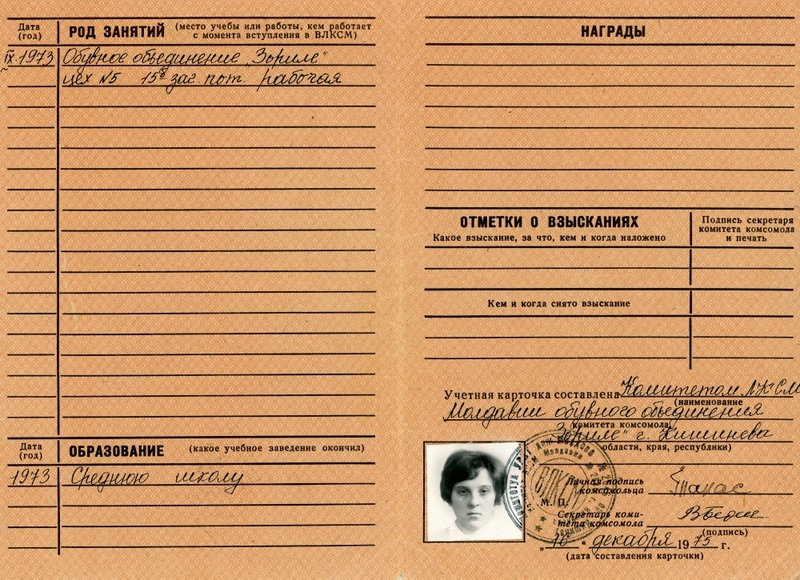 Many deportees were allowed to return home after Stalin’s death and the rate of frequency of return differs from person to person, ranging from the immediate return to those who waited decades (whether by choice of by circumstance), to return home. The Graur women slowly built back their life in Vadeni. It is surprising that they were allowed to return back home, as many deportees were barred from returning to their ancestral villages and had to instead survive elsewhere, regularly depending on the kindness of family members. Ana currently lives with her son Alex and his family and says that she wants to live to see her family safe and settled. During Alex's 48th birthday on August 23rd, she told me, "In my dreams my husband (Vladimir, who died years earlier) comes to me and says, 'Join me, Ana.' but I say no, I am happy here and I want to be with my family." Pasha keeps an old photo of her younger self with her two sons beside her. It typically acts as a bookmark in her old Cyrillic-written Romanian Orthodox Catholic bible. She loves talking about her children and misses them terribly. February 4th is her son, Vitali's, birthday, two days before my own and as I visit her she is very sad. Her son died years earlier in an automobile accident. “My most precious Vitali died in 2004.” She says. She said she would try not to cry about her son on his birthday, but that it is difficult to think of the loved ones she has lost in her life, her brother, her younger sister, her mother and her son. She regularly kisses the old photograph as if trying to kiss the people within them. When Pasha's son, Leonid, came to visit from Ukraine, she lamented that he spent so little time with her. Leonid, in his youth, was a professional soccer player and still plays and coaches, a fact that makes Pasha proud despite the fact that it required him to be away often. One day during Leonid’s visit, wearing a red dress sent to her from family in Italy, she said, "I dressed nicely, yet Leonid doesn't come." Leonid instead decided to spend much of his trip visiting his cousin, Alex, Ana's son. Both Pasha’s sister, Ana, and her daughter-in-law, Ludmilla lament that same fact. “As you can see she has no one,” they tell me one evening, “She has no one to come visit her and she is very lonely.” Ana is even moved to tears that the family cannot do more for her. Moldova is the poorest country in Europe and as a result life can be extremely hard. Ludmilla (Ana's daughter-in-law and wife to her son Alex) has to travel to Italy every three months to work to pay off the wedding of her eldest child, Ana’s grandchild, Ioana, and the family worries about Pasha’s death. “That would be a tragedy if she died,” Ludmilla says, “We cannot pay for the funeral and my son, Pavel, will be getting married as well.” Ana cries to me, “Please do something for Pasha, please!” “I will try.” I say, but I little know what to do. A common theme to the deportee’s story is that the story did not end after Stalin’s death. 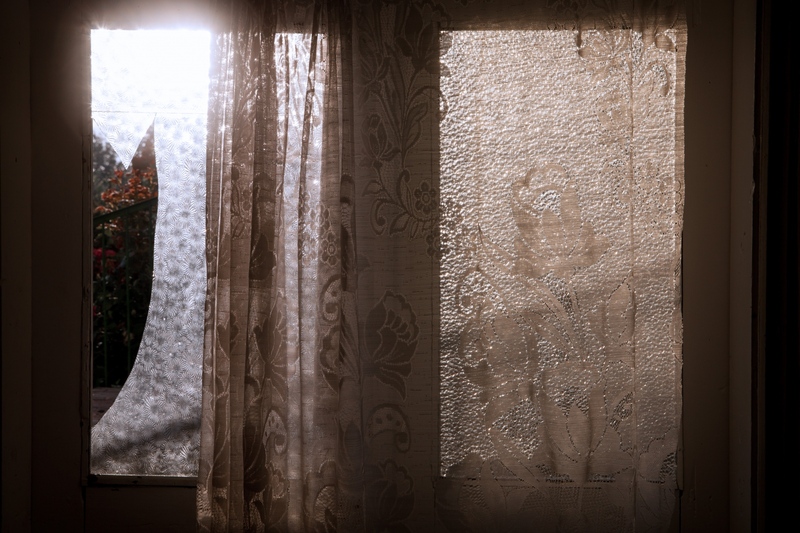 The larger story is about the social and political repression felt by deportees after they returned to Moldova, as well as the long process of building their lives back up after having everything taken away. The resilience of the deportees who experienced this history shows that through great pain, life does go on. Pasha's death from Clary Estes on Vimeo. This video depicts the moment of Pasha's death. Viewer discretion is advised. As Pasha lay dying I had an intense fight with Pasha's sister, Ana, and the rest of her family, in part, due to the immense stress I was under taking care of Pasha. 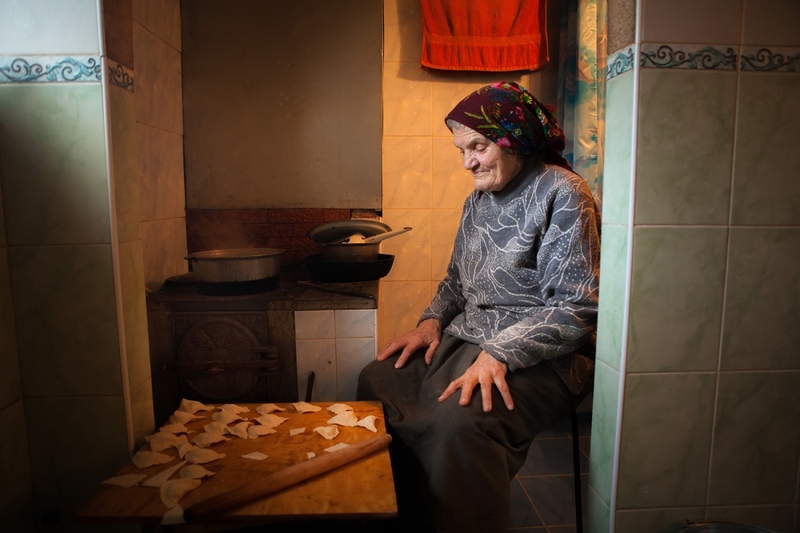 For hours Pasha would scream and moan in pain saying, "Va leu, va leu, va leu," a statement many elderly Moldovans make when exerting a great effort or in great pain. She would also pray to God to alleviate her suffering. I got little rest as I cared for her. Pasha was ill during the harvest season for raspberries, the main cash crop of the Graur family, which required Ana and her son, Alex, to sell raspberries in the market during the morning and early afternoon, while younger generations picked the raspberries in the fields. Not only did the rest of the family work while Pasha was sick, leaving me to care for her, they also would not come to terms with fact that she was dying, letting themselves believe instead that she was just very sick, but would get better soon. The following is the account I took of the fight and the subsequent rain storm that came after in my journal. The following is a journal entry I made shortly after my fight with Ana and her family. Or perhaps I called the storm. I was speaking to Cecilia as it approached; the winds swirled around me and threatened to storm. The lighting struck and I was afraid but I stayed. An opening in the clouds exposed over our home; the wind blew; the lightening struck; the birds cried; I stayed. For so long these forces thrashed. And I waited. Finally and slowly, the rain, the deluge, the baptismal rain danced with the lightening. Cecilia and I wondered if I made the storm. Before, I had taken a rest, hoping Ana would care for Pasha. I awoke later and found Ana in the Casa Mare (main house) and Pasha without anyone. Her water spilled, her body hot, she in need of so much help. vomit from her face and chest after we couldn’t get her to swallow a pill. And I came down and I raged like the storm. “Why didn’t you help me? !” I screamed at Ana. My words became something else. Something to the air that bore the storm. Still as I write the lightening strikes, the thunder sings. Alex tried to calm the situation, with condescension and I raged. that ended at the house Pasha stays in. As I saw the light change from grey to pink to yellow, I saw a great being move across the land. It surprised me. Even now the lightening lingers. The air is cool. I followed the rainbow to Pasha as she rested, Ana with her. The sky was pink, the rainbow was warm and barely visible. And said she would sleep with Pasha tonight. I gave her my sleeping bag. I hope, with great love that the rain, the rainbow, the sun, the thunder and the lightening take Pasha to peace tonight. 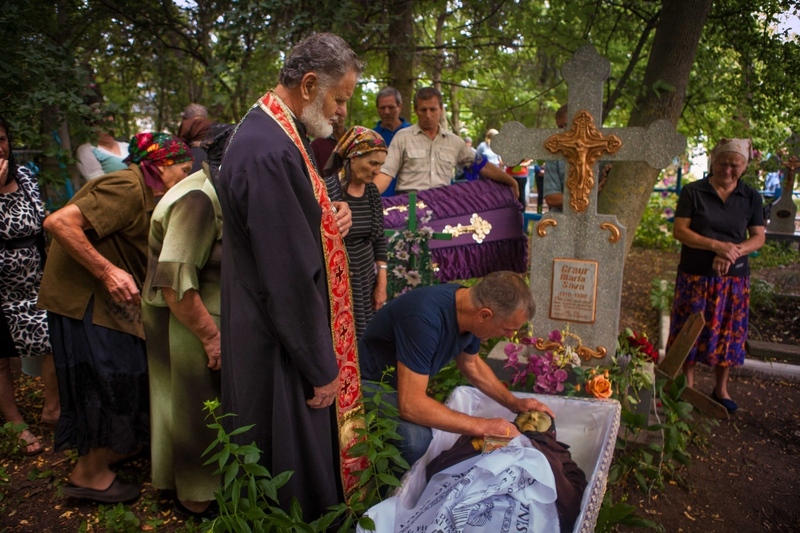 Pasha's sisters, Ana and Marusia cry at her coffin during her funeral. Despite the fact that Pasha's life was extremely difficult, she was often able to be thankful for what she received, rather than what she was denied. Easter is the largest holiday in Moldova and is a time to celebrate the coming warm weather, as well as relax with family. 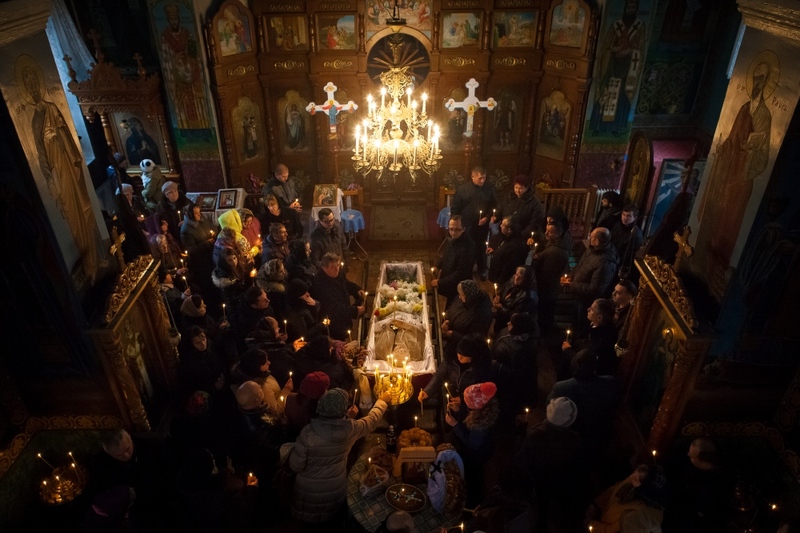 The midnight and early morning church service is very popular in the village and every household comes to worship and have their Easter feast blessed by the local priest. However, Easter was especially hard on Pasha and her desire to go to church was more acute. In many ways it feels as if Pasha had been dealt a double blow; first she was denied the church as part of Soviet policy, and later she was denied the church due to her illness. 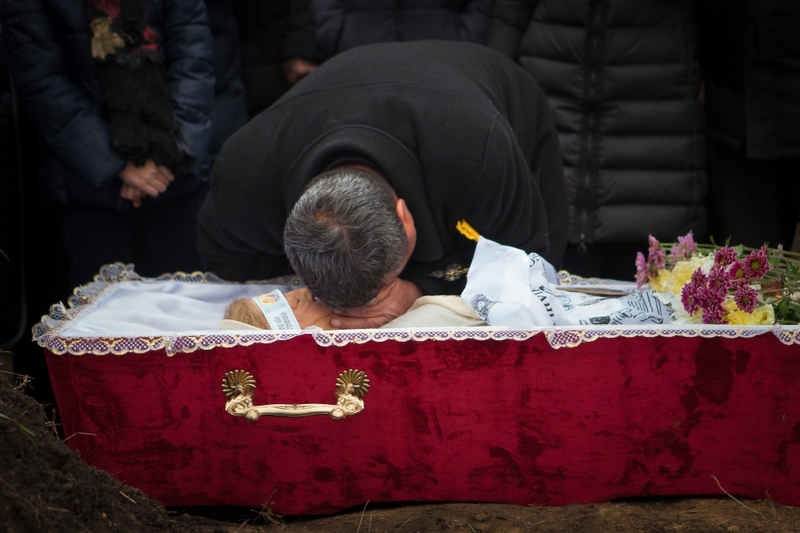 Pasha’s sister, Marusia, cries over Pasha’s body during her funeral. Marusia, though she lived in the next town over and suffers from many physical ailments of her own, tried her best to keep in touch with Pasha before and during her illness. She was able to be with Pasha on the day she died, though she did not realize it would be the last day of her life. In many ways, I believe Pasha felt she could die having seen her sister. Marusia brought medication to make Pasha more comfortable and thoroughly cleaned her room and bedding. The day Marusia came to see Pasha was the first day I had gotten proper rest in weeks. Despite repeated calls for Pasha’s remaining son, Leonide, to come see her before she died, he never came. “I am too busy.” He said. Here is an excerpt of Pasha's sister, Marusia's, writings about her deportation, starting from her birth until her life in Vadeni with her sisters. She writes in the Romanian language using the Cyrillic script, a common tendency in the older Moldovan generations. 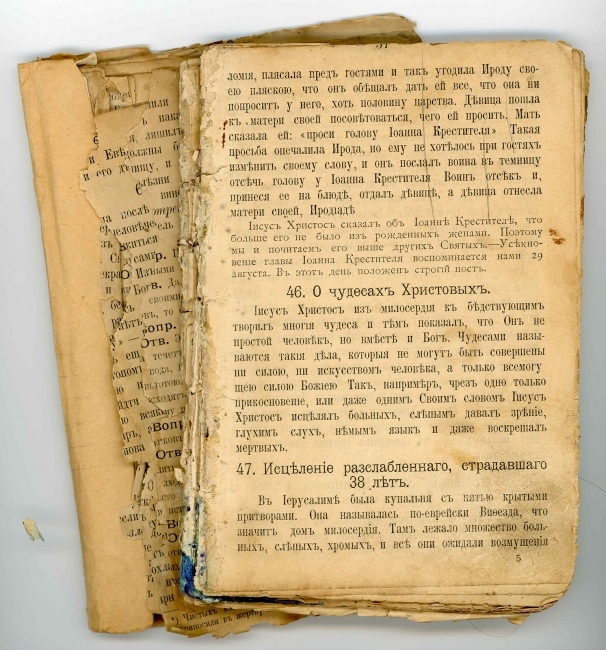 In fact, many of the old Soviet era books still sitting on library shelves in rural villages are Cyrillic written Romanian books and are quickly becoming obsolete as the younger generations are choosing either Romanian books written in the Latin alphabet or Russian books written in Cyrillic. Much of the deportee writing is disjointed and hard to follow. A great deal of this project has been parsing through various accounts and trying to understand to the best of my ability what actually happened. (Moldova Deportees 790) My name is Boj Maria Nechifor, Graur being my maiden name, and I was born in the village of Vadeni, in 1943. I don't remember much, but my mother used to tell us about our childhood. The war began; the Red Army entered the village. They looked for wealthy people at the very beginning, and my father, Graur Vasile, was one of them. They imprisoned him and deported my grandmother and her two children to Siberia. They [confiscated] their fortune and gave it away to whomever they pleased. They [repurposed my grandmother’s] house into a school. After some years, I don't know how many, around 1941 perhaps, I forgot… the Romanian army came back, and after another two years, the Red Army returned as well. My father, Graur Nichifor, and mother, Marusca, had five children, four girls and one boy. My mother took us all to Siberia; to Mâca. 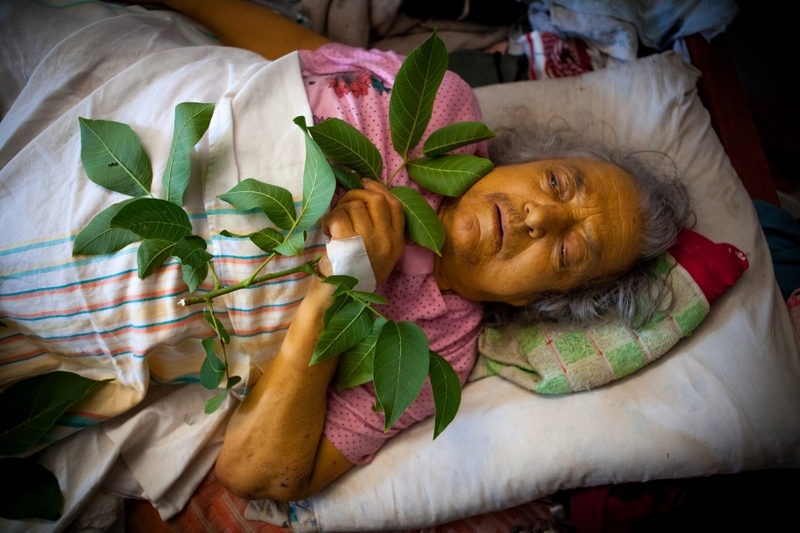 (Moldova Deportees 791) to [live with our grandmother,] Marioara; [we lived] there, as I remember my mother [telling me,] we lived for several years and the mosquitoes bit us a great deal; we were full of pustules. One day, my older brother got lost in the woods while he was off with the horses to pasture and there he spent two days and sleeping in a tree. My mother wept and told our father she wanted to return to her native village. She was from Cainari Vechi. Mother told us that our father didn't want to, but he took pity on us and took us as far as the bus station in Floresti. He left us at the station, my mother and her five children, without saying where he was going. He left, because he was afraid to go back to Vadeni. Our house had been taken by the Russians and converted into an administration building for the kolhoz. My mother said we went to Cainarii Vechi, but even there we didn’t have a place to stay, so we had to return to Vadeni. 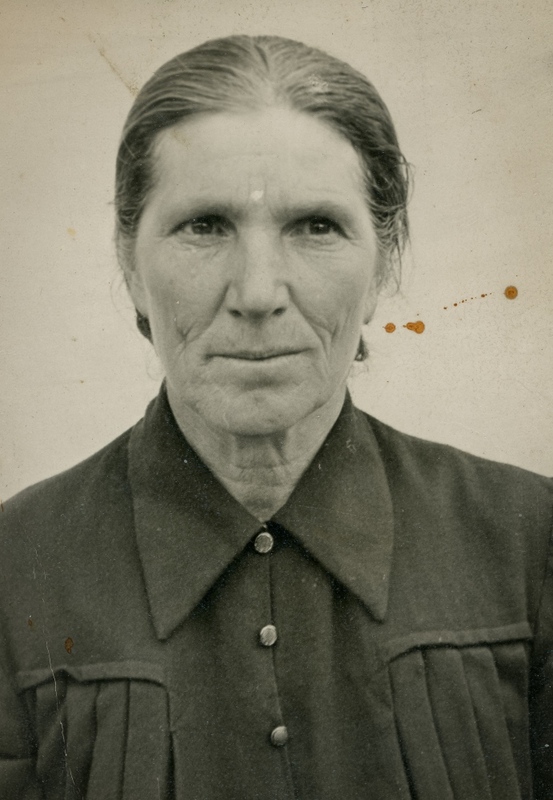 (Moldova Deportees 792) Also in December of 1952, my mother was arrested and was brought to the town of Soroca. Several days later we, the three daughters, were also were brought there with our older sister, Nadea, [to Soroca]. Nadea was already married and we were staying with her. My brother, Andrei, was in the army. They took us to the Soroca prison and one day we saw that they were bringing another bed and we saw that Nadea was [being brought in]. She was arrested while her husband was not home. He was living in a small room made that he had constructed and that is why he was not taken. We stayed in Soroca for 10 days and later we were taken to Odesa. There I got sick because they fed us bad bread that I was not able to eat it. (Moldova Deportees 793) We caused a scandal when we told them to give me white bread because I was a small child. From Odesa they moved us to Moscow. There we stayed 10 days in Cusibusele and later in Almata. Finally, in February 1953 we made it to Krasnoiarskii Krai and Krasnii - Okteabri village. It was cold and snowy. We were not dressed warmly. They took us to the director of kolhoz and they gave us a warm winter coat – called a cufaica, and boots. They gave us a small house with a basement and wood for fire and some wheat for food. My mother was hired to work with pigs. 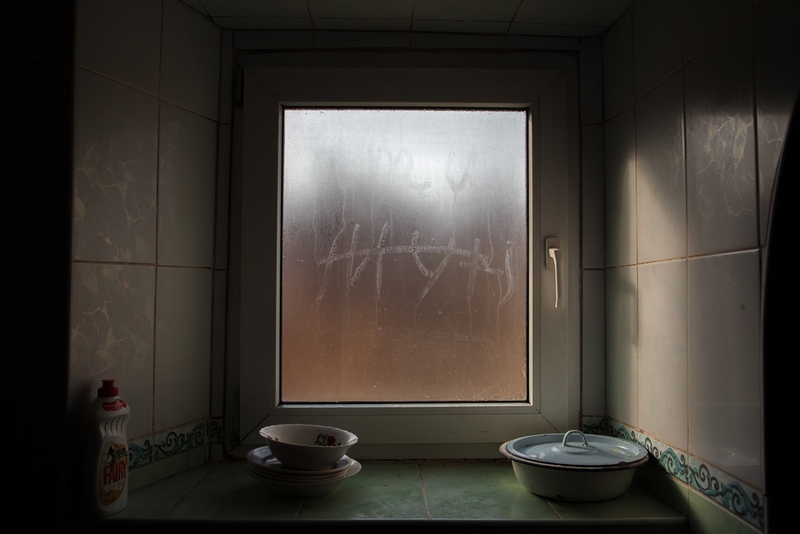 (Moldova Deportees 794) When returned to Vadeni [from Siberia] we passed a woman’s house [upon arriving] and she gave us an old room to live in. Her children were at school [so she had room]; my mother was running around trying to hide [from the Bolsheviks]. She suffered a lot. Now I’m telling you my story as I remember it about how my mother came during the night so that no one would see her and bring us food. One day she came bare footed and asked us to wash her feet. [As we washed her feet] we looked and the water was red because her feet were injured. We told her to stay with us, but she was afraid. One day she decided to stay and someone told the police and they came, but she was not in the house. One of us went and told her and she ran away. 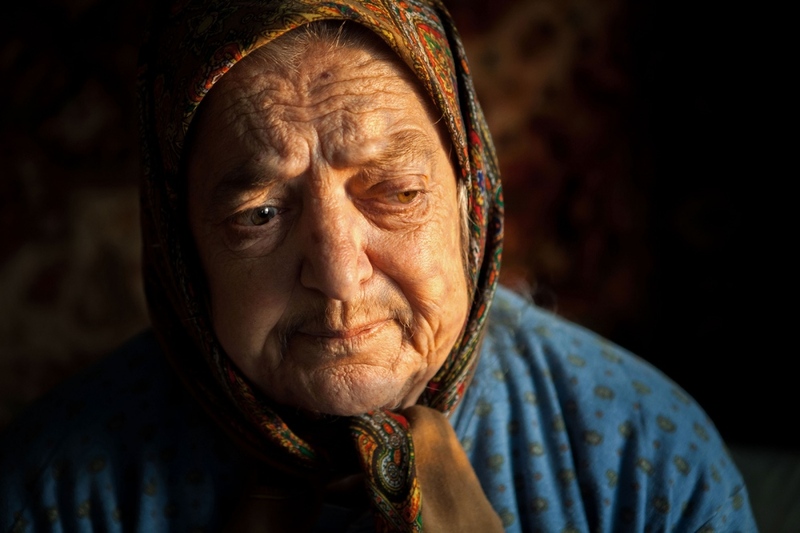 (Moldova Deportees 795) She was hiding at the home of a woman named Ilenuta Repescu. They saw her and told to the police. The woman hid her in her stove where she had been baking bread. The police came and they asked where my mother was and the lady said she didn’t know, [saying instead that] she had seen her [run in the fields] so they left [after her]. My mother barely survived [because the oven was so hot]; [she almost suffocated while] hiding. Five years passed and in 1952 we heard that my father was captured in Romania and taken to Odessa and condemned to life in prison. What really happened we didn’t know for years. A woman came and told us she was there with him when he was condemned for life. 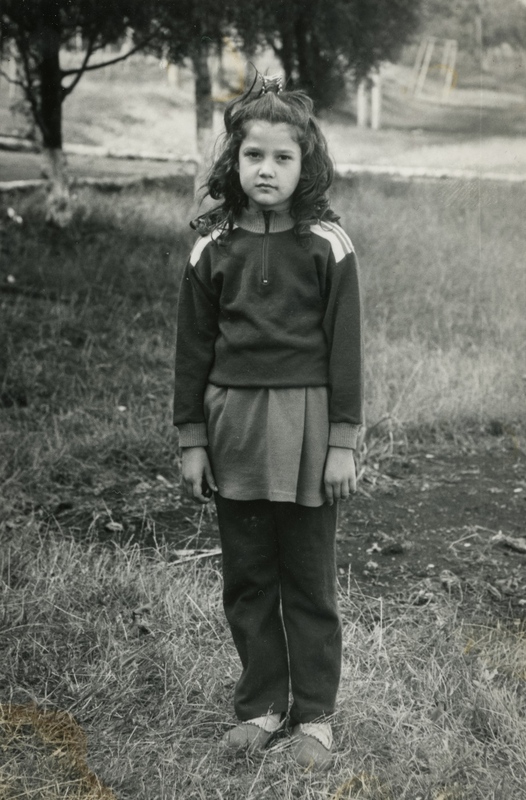 (Moldova Deportees 796) [In Kazakhstan] my sister was working at a cow farm, but we 3 girls were taken to a Russian school because the other ones were Kazah one. It was hard for us, but we were not afraid. The people were nice and helpful and helping us however they could. We lived like that for a month and Stalin died in March. After 2 months we were free [to return to Moldova]. That spring, my sister Nadea made some money and came home. When she came in her house was living an accountant and at the farm they were keeping horses. She didn’t have a place to go, she stayed with [various] people, but later went to Floresti to work at the tobacco factory. Her husband when came back and saw everything married another person. My brother returned from the army and got married. (Moldova Deportees 797) We lived [in Kazakhstan] for 4 years. Our older sister, Parascovia (1938), got sick, but she managed to get well and our mother decided to send her to Moldova to our sister Nadea [who was there at the time]. Two years later we returned after finishing school in the spring at Duminica Mare village. We were met by our brother and our brother-in-law with the horse cart. Finally we made it to Vadeni, we arrived at our sister Nadea who was back with her husband and they managed to get their house back. My brother was staying with his mother-in-law. So we lived with her sister and the problems started. (Moldova Deportees 798) One month we lived with our relatives, but later we felt left out because they didn’t have kids. My mother bought a cow, but we [didn’t have enough food to] feed her. We would go out to the fields and gathered food for the cow. One day we returned home so cold that my feet were frozen in my boots; we had rubber boots and we couldn’t take them off. I got very close to the stove and still was not able to feel the heat. I put them on the stove and fell asleep. As a result, I burned my foot and was in pain for a while. With God’s help the spring came. My sister, Parascovia, was working at the milk farm Aliuksa robka and there found a man and got married. My poor mother organized a small wedding as the father of the Parascovia’s husband wanted. We accrued some debt because of it. (Moldova Deportees 799) We, my mother and we 2 girls, didn’t have a place to live. We went to the management of the village and asked them to return to us our house, but they refused. They said they would help us and guess what? They gave us a place to build a house and gave us some materials. They told us to go to the construction depot where there was rye straws and dipped in oil [to build with]. They told us to cut it by hand and [that we could use it to] make the roof. We didn’t have stones to build with, so we made a hut and lived there. My brother Andrei and I went to a stone factory near the forest to get some stones for the house, but they wouldn’t allow us to take any. Moldova Deportees (800) Later we made clay bricks and built a small house. Our neighbors helped us and we build the roof [together]. The forester gave us some wood and with rafters and rods we made the [frame of the house]. A good man came and built our courtyard. We didn’t have windows so people gave us used doors and windows; that is how the communists helped us. [Our grandfather’s house had been converted into a kindergarten]; only years later [was a new one built]. (Moldova Deportees 801) The school was there for many years and my children studied there. At my uncles house they opened a forge. His name was Mihai Graur, he had ran away and left his 6 children. His wife was taken to prison and the kids were taken to an orphanage. That is how [the Bolsheviks] took their lives. Later when their house was left almost completely derelict, my brother purchased it and built a new house. Now I will tell you how I married in September of 1957’ Instead of going to school, I got married when I was 15. (Moldova Deportees 802) I married a man whose wife had die during the birth of their child, Ionel. When we got married, his child was at the hospital in Soroca. The hospital called him to come and take the child because it was very weak. When we brought him home he was injured, skinny legs and big stomach. I my self was a child so I was crying. I found some good women [to help] breast feed him. So I started taking care of him and he got better. It was hard for us those days, because we didn’t have electricity and fire we made with just kindling. (Moldova Deportees 803) [I would have difficulty warming] up the baby’s milk because all I had was a lamp during the night. But I loved him and he was very handsome and this is how we started our life together. The man had a small house with one window and a door. We started making clay with our feet. We didn’t have water so we would have to bring it from a well that was 50 meters away from our house. We put the clay we had in one hole and would smooth it out to another one with our feet. That is how we made the hut, but we didn’t have [anything to build the roof to] cover it. We raked [and collected] wheat stalks and worked hard until we had our little house and the hut ready. In 1961 I gave birth to a girl named, Clava. 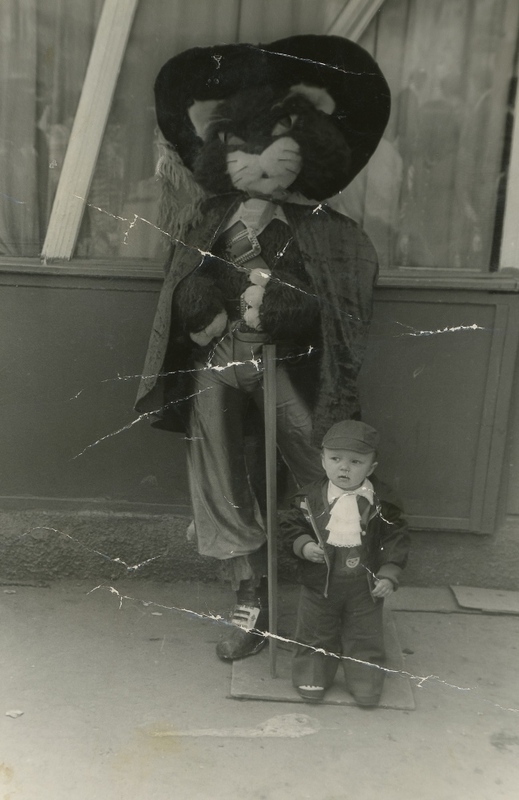 In 1962, I gave birth to a very anticipated boy, Dumitru. We named him after our father-in-law who died in the war. This is the story of my family; with happy and sad moments. From Ion I have a grandchild named Eugen. From Clava 2 grandchildren, Andrei and Ana. Ana has a son now, Marinel. From Antonina I have 2 grandchildren, but one unfortunately died at 19. He was studying at the university at a painter. The other one, Octavian married Oxana and they have a boy Stefan. Dumitru has 3 girls: Mihaela, Anna-Maria, Paula. (Moldova Deportees 804) So here I end my story. There is a saying: “the wolf changes his hair, but not his nature” For this we need to do be good to one another. God hears and sees us. I wish peace on the earth and good health to the entire planet. With respect, Parascovia Gorbmevecaia (Pasha). 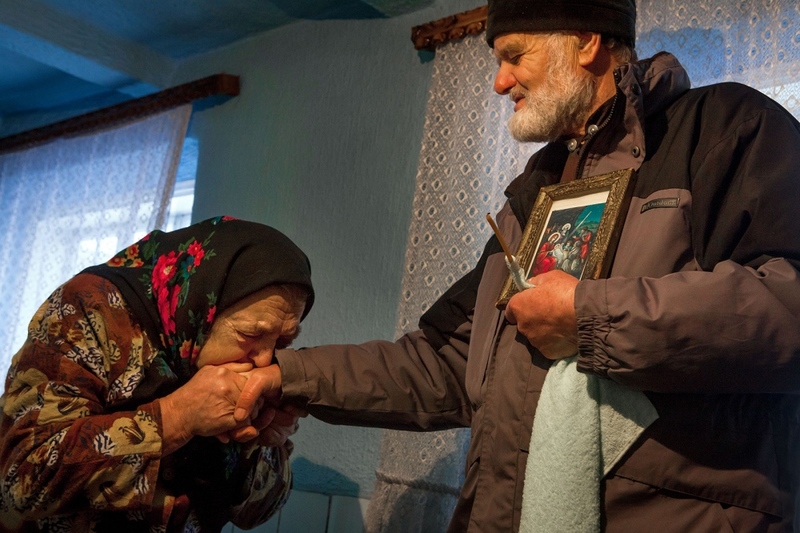 Nina Postica, a former deportee to Siberia, and her family go to visit her brother and mother in her parents' home village of Nemteni on the border with Romania for Pastele Blajinilor, an orthodox portion of the Easter celebration where families go to the gravesites of loved ones with food wine and offerings, blessing the gravesites with their memories. Nina's family was deported to Tyumen, Russia, in Western Siberia, in 1941 during the first wave of deportations in Moldova. The first wave of deportations was aimed at intellectuals and political disidents and ranged from 1939 until 1941. The second wave was directed at economically higher casts of people and took place in the late 1940's. Nina's father was sent to the gulag from which he was later released and joined his family in Tyumen after Stalin's death. Nina was born in Tyumen shortly after her father's return. “So few of us remain… From those who were taken away… Who were so wrongfully taken away. They should give them justice!” Says Nina. Nina lives with her husband, Ion, who was also deported with his family at the age of 3. Ion and Nina were married on the 21st of May 1977, after only 4 months of courtship. Their godparents, Tamara and Gerasim (who was also a deportee, part of the Constantinide family), stand beside them. Gerasim lives only a few doors down from Ion and Nina in Bubuechi, Moldova near the captial, Chisinau, and speaks mostly Russian, still having trouble coming back to the Moldovan language. He is ethnically Greek. While Nina’s family was deported to the more western of the Siberian region, Ion’s family was deported to one of the eastern most parts of Siberia, a harsh, wild and frigid landscape. 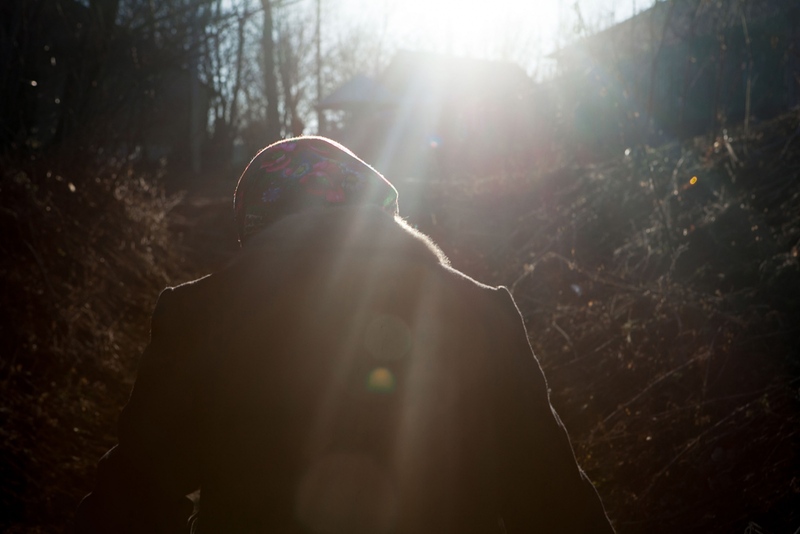 There are many stories of deportees freezing to death in the western Siberian region due to lack of proper clothing coupled with the need to travel long distances to go to school, work or move their families to other work camps. Ion and Nina regularly spend the afternoons with their grandson, Danu. Both Ion and Nina make a point to educate their grandchildren about the history of their deportations from Moldova. Nina’s father ingratiated himself to his Soviet wardens by working in the kitchen and baking bread for the other prisoners, as a result his death sentence was reduced to a 5-year sentence and he was later able to reunite with his family in Tyumen, Russia. 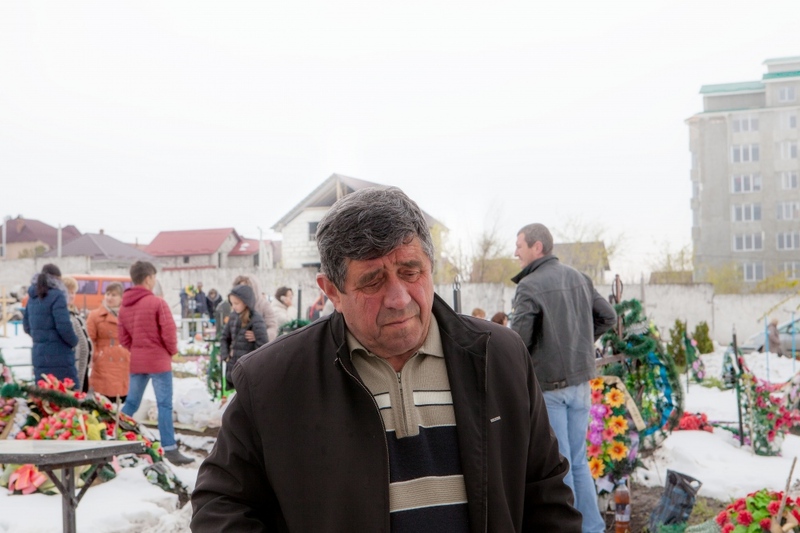 After he was freed, he returned to Moldova to look for them, eventually finding out where they were through relatives. Nina was born shortly after he made his way to Russia. Some family members, and many men in families, choose to self deport as a way to be close to their families who where sent away. Nina’s father, Elli, like all Soviet prisoners endured harsh conditions in the gulag, which killed many and likely were the cause of Elli’s health problems after he was released. It is a common theme in the deportations history that families do not know if their loved ones died in the gulag as a result of illness or because they were executed. In the image above, Elli's last name, Tanase, is written in Cyrillic script, as well as his year of birth, 1901. Nina has a copy of her mother's bible in her home. I often hear stories of her father's bible as well (now lost), which traveled everywhere with him and was a source of solace. “[My father] had his prayer book with him, even in the camp, and he had faith in Jesus Christ. That is what gave him strength.” Says Nina. The Soviet Union worked hard to suppress religious practice, a fact that was hard for many Moldovans to handle. 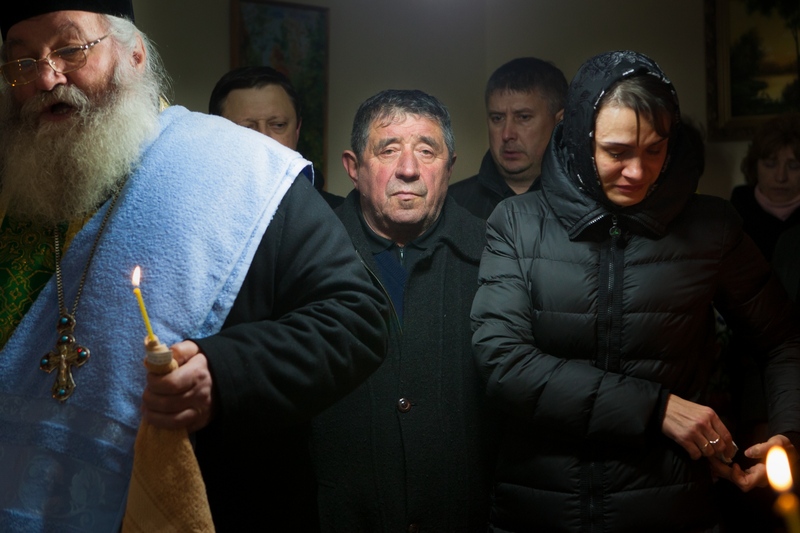 Moldova is still a highly religious country and Orthodox Catholicism can be seen in every facet of life today. 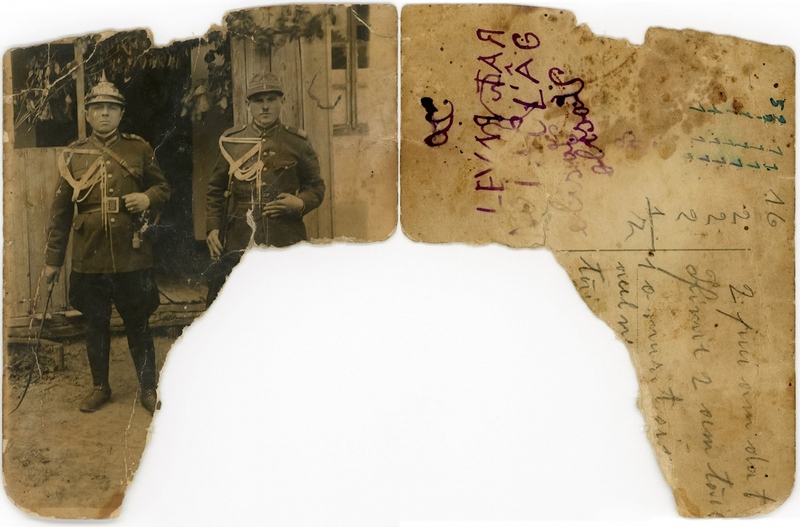 An archive photo of Nina's father, Elli, shows that he was part of the Romanian army, which probably attributed to his later arrest. I asked about his history before he had been arrested. Nina said he didn't talk about what happened, she only knows that he was a police commissioner charged with anti-Soviet propaganda – a charge the family believes to be untrue. It was dangerous for the family to talk about his life before the deportations, both in the home and in society. Nina doesn't know what was written on the back of the photograph. 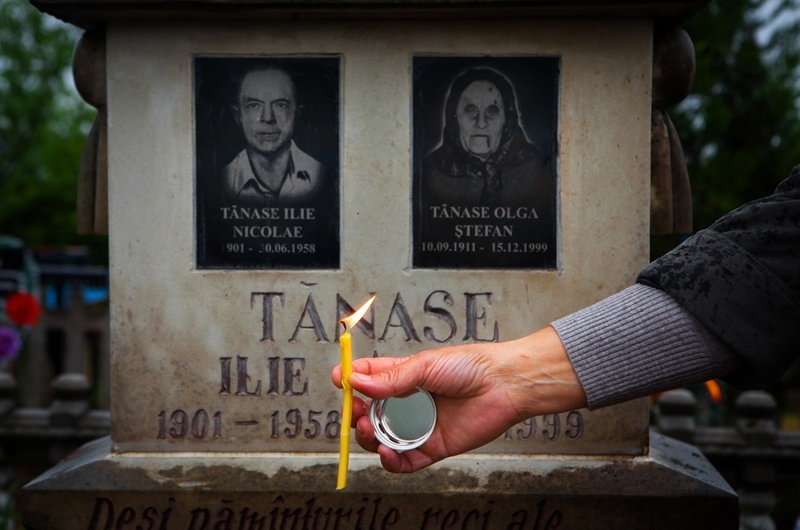 Nina puts a candle in the earth in front of her parent's gravesite for Pastele Blajinilor, a part of Easter in Moldova where families go to visit their relatives’ gravesites and give offerings and pray. 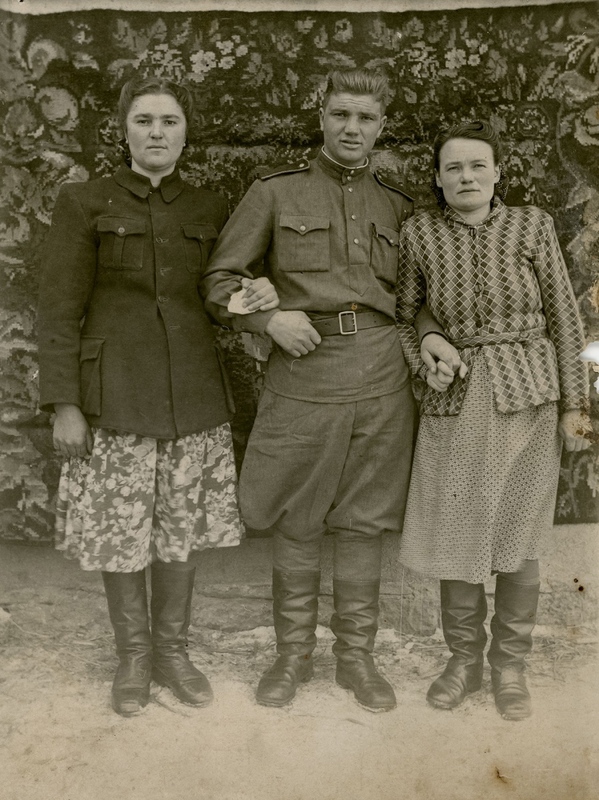 Pictured above are her father, Elli, and her mother, Olga. Nina remembers of her mother, “After Stalin died, my father was freed. He returned to Moldova and started looking for my mother. He sent a letter to Moscow, in the Soviet Union and asked where my mother was - where he could look for her so they could reunite as a family, but he had no luck… it took too long to get the legal forms. However, he found out where mother was from relatives and wrote to them asking if he could to go there. And so he went to my mother and found her where she was living. Thus, the family was reunited… [After my mother and father were reunited] another three children were born, (including Nina), but my father longed to return to Moldova and when mother and the rest of the family were allowed to go back… father got sick and died in Siberia… [When my parents were reunited, my father had] said to [my mother], ‘You'll remain by my side until my last breath. I'm so sorry that you have suffered so much because of me. I’m very, very sorry. And the children must have suffered too. I regret to put you through all this. You go back home, to Moldova. You have no place [in Moldova] to go. You have no house… but you are strong. You'll survive and you'll take the children home.’ He wanted very badly that mother should return with us to Moldova - to bring us all back. 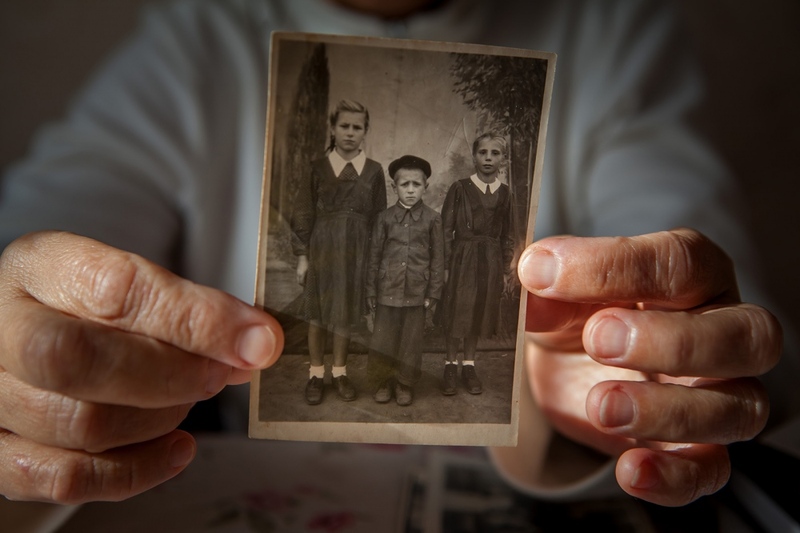 Mother says that she granted his last wish to bring their children home.” Nina remembers. Surprisingly, having been born and raised in Siberia, Nina’s memories of Russia are much more positive than her memories of her family’s return to her father’s beloved homeland. “… one could manage to live in Siberia, if one was hard-working… We had a good life there; it was easier to live [in Siberia] than here, in Moldova or maybe I don't know much about it. But when we came here, it was very hard for us, very, very hard.” Nina recalls. 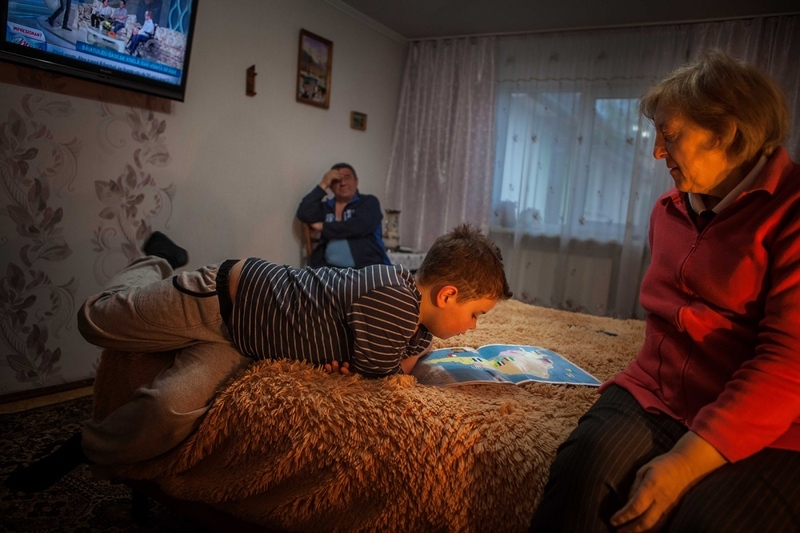 Nina's mother, Olga, holds Nina's son Pavel years after they have returned to Moldova. The hardest memories for Nina are not, in fact, her memories from Russia, but her memories of her family's return to Moldova after her father's death, “What one can remember is what hurts one the most… when mother set us around the table, 7 souls (Nina’s mother, Olga returned to Moldova with her 7 children), who had no table, no place to sit around and eat and not much to eat anyway. She would cry, and that was the most painful for me. It's important that people never forget this and that justice will prevail.” Nina remembers how her mother would cry at her inability to provide for her children and as her children saw her cry, they would cry for their mother as well. Nina, who is a diabetic, takes her insulin shot every night at 10 pm. While Ion is very active around the house, Nina’s pain as a result of her illness keeps the pace of her life very slow. Her eyesight is also very bad, a fact that she laments, having been a voracious reader in her youth. Nina, like many deportees, suffers a wide variety of health issues that may have been exacerbated by the harsh conditions of her deportation. Frequently as we are visiting with each other in the evening she will recite a poem by Mihai Eminescu, the most famous poet in Moldova. Down the same untroubled lane. Never shall again come thence. Tread for ever that same way. 'Neath the hidden hawthorn's bough. Though not a word had either said. Neither had the time to ask. Or believe a woman's word. In 2017, I spend Pastele Blajinilor with Ion. We slump through the snow and mud up to the cemetery. Just days earlier a freak late-April snowstorm hit Moldova. As Ion and I have talked about his past, Ion recalls how the deportations were a tragedy for his parents, but he was so young at the time that he still struggles to remember some parts. Ion is a quiet and warm, yet stoic man who speaks less of his deportation than Nina. The ways in which deportees remember their deportations differs significantly, some coming back to their experiences over and over again, and some thinking of them as a footnote in a young life. Today, Ion tends to focus more on the issues directly at hand, caring for his garden, making wine, and spending time with his family. 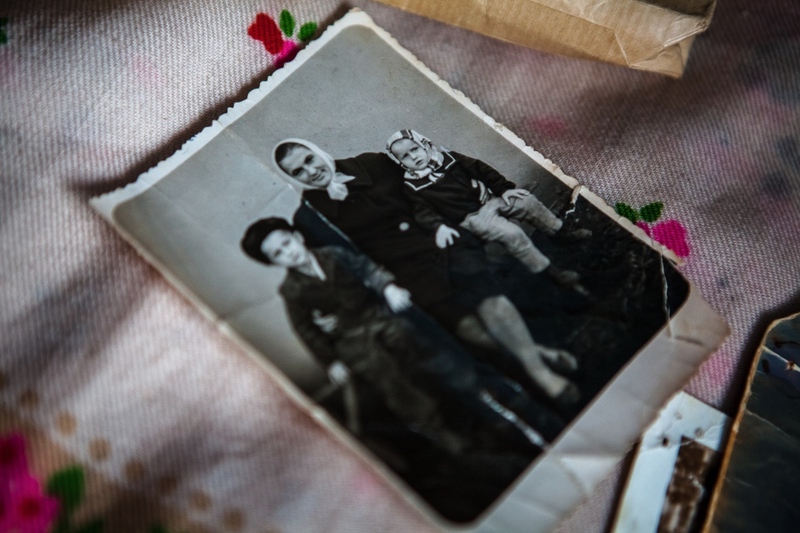 Ion Postica keeps a photo, taken in Siberia, of his family after they were deported. 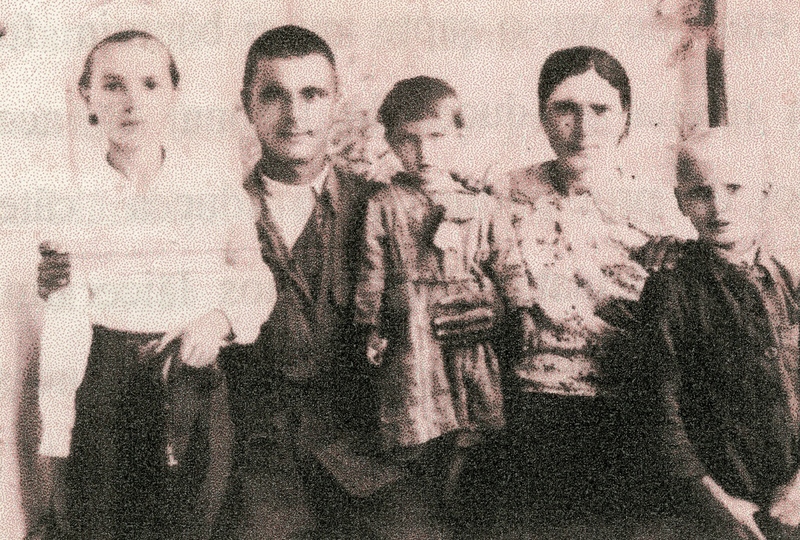 Ion’s brother, Andrei (pictured lower center), echoes Ion’s sentiment that their parents were the ones that bore the greatest burden of the deportations during their time in Siberia. “I was little. I would play all day long. Our parents were the ones who endured [the hardship]… I didn't feel the burden of my parents' problems, they endured them all by themselves.” Says Andrei. When the Soviet Union fell, many people found their life savings reduced to nothing. This included partial reparations for deportees, requiring them to, yet again, start their lives from scratch. Ion's wife, Nina, holds up a photo of Ion and his siblings that was taken in Siberia at the time of his deportation. While Ion successfully returned to Moldova, not all of his family was so lucky. Shortly before their return a younger brother of theirs died due to the extreme cold of Siberia and frailty of body that was a reality for many deportees at the time. Frequently, deportees talk about the small portions of bread and basic food they were given for their days’ work, as well as the small salaries. This coupled with the intense cold of Siberia killed millions of deportees. It was not uncommon for deportees to sell precious family heirlooms for a bucket of potatoes or the like. 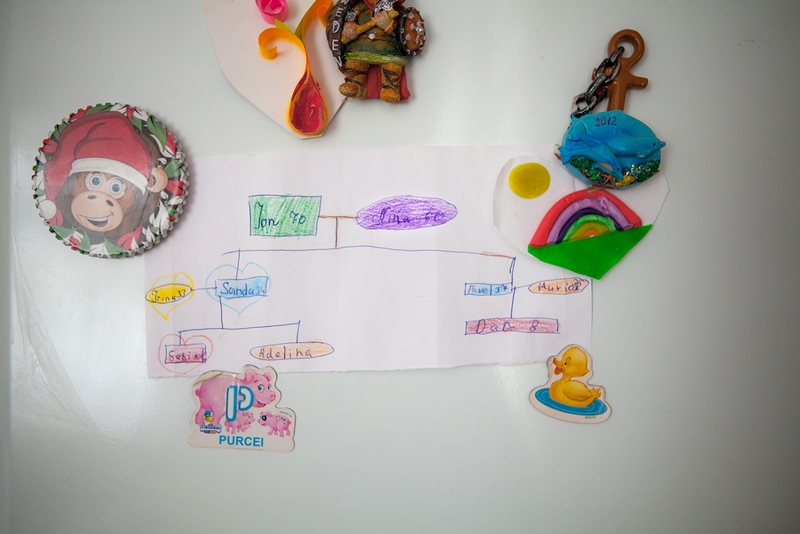 Ion and Nina have hung a family tree made by their grandchildren on their refrigerator, which is held up, in part, by handmade gifts. Many deportees talk about how, despite the hardship they faced in the past, they are happy with their lives now, in part because they are so close to their families. Ion and Nina’s home is filled with their children, grandchildren, brothers, nieces and nephews everyday. I am struck by the tenacity of the human spirit in the face of seemingly insurmountable hardship. No matter what the odds, life will go on and thrive. People will survive and love again. Nina died on Thanksgiving day 2016. I called Ion with plans to come visit for Christmas. Ion answered the phone. When I asked how he was doing he simply replied, "Bad." "Why bad?" I asked. "Nina a morit." He said. Nina died. I was shook by the unexpected loss. For the next couple of days I was sure that I had misheard Ion. 'My Romanian is bad, I couldn't have understood correctly,' I thought. But unfortunately, when I went to their home, there Nina was. After a slew of health issues, including complications from diabetes, Nina's body gave out and she died. 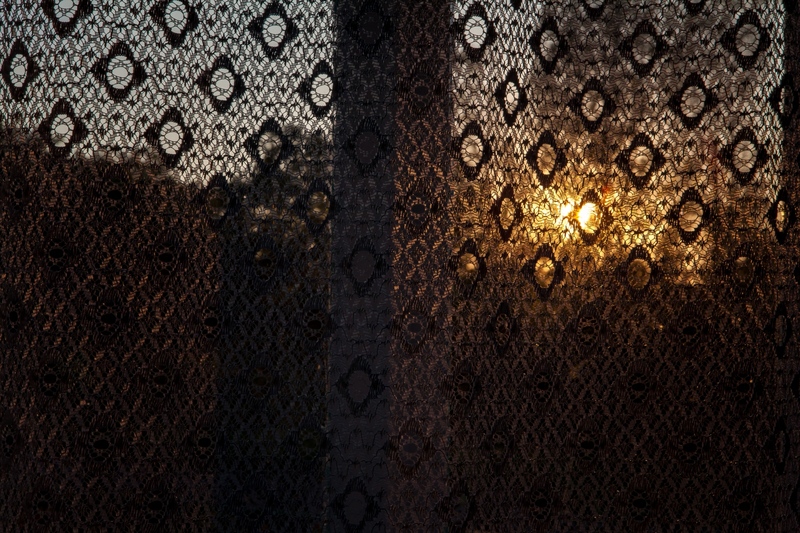 Nina Postica remembers her time as a deportee in Siberia when her mother was forced to sell their beloved Moldovan carpet in exchange for a bucket of potatoes to survive the winter. Animation by Ghenadie Postica. Nina Tanas's, Komsomol (All-Union Leninist Young Communist League, a political youth organization in the Soviet Union) Membership Certificate. Nina, like many deportees had to survive in the Soviet Union by playing the role of the good communist supporter, despite the fact that she did not personally support the soviet Union. To have access to resources and opportunities, young people under the Soviet Union had to join communist party organizations. Ion says goodbye to Nina one last time at her gravesite on November 27th, 2016. Ion, a typically well composed man, broke down in the moments before Nina's body was put in the ground. Nina was buried just a few blocks from Ion and her home in Bubuiechi. "It is a quiet and calm place," her son Alex said, "I think she would have approved." Nina's granddaughter, Adelena, looks at her grandmother's body during the church service at Nina's funeral. Fatigued from grief she is quiet for much of the event. 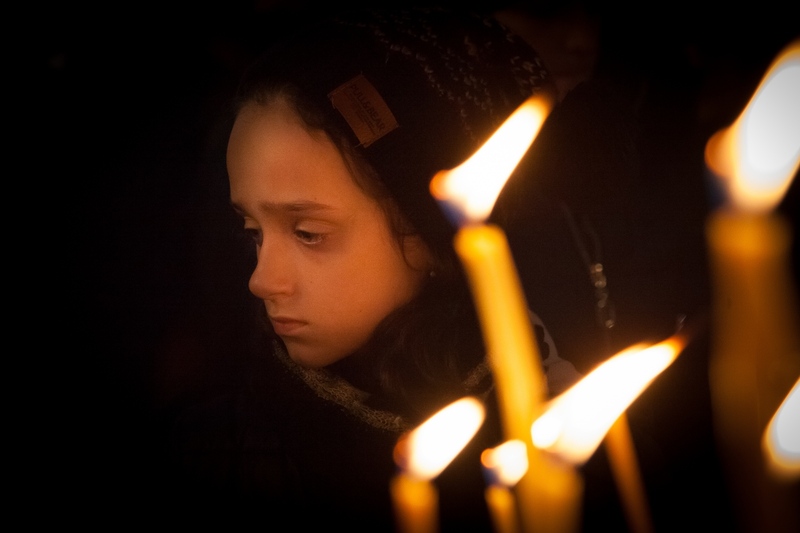 I occasionally hold her close and we take a moment to grieve and listen to the Orthodox chants of the priests. Like Nina, Magdalena is also diabetic and her family keeps a close eye on her diet and insulin shots everyday. I stand at the head of Nina's casket as we start the funeral ceremonies. Though grieving, Ion takes a muted position in the activities. He is quiet and as I raise my camera to photograph him he looks me straight in the eye. A day earlier, during the second day of viewing for Nina in their home, Ion and I talk in his and Nina's old bedroom. 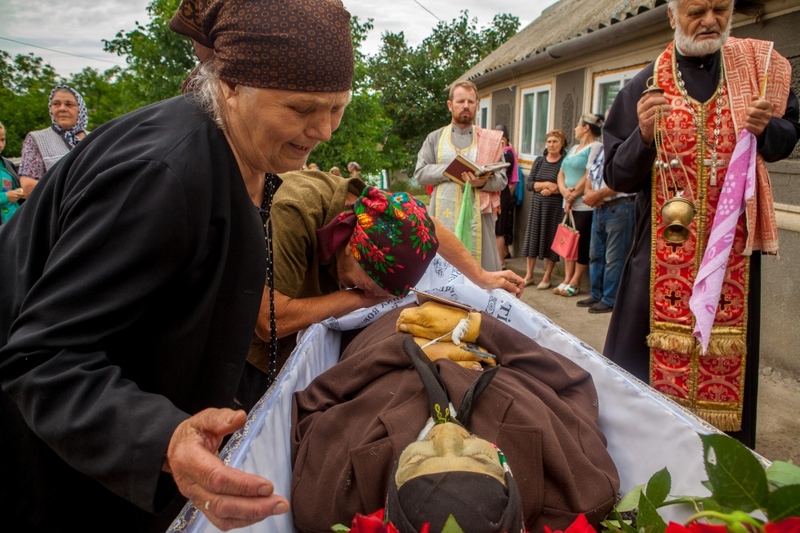 He is looking for sheets to cover the windows - an old orthodox tradition during funerals. "Nina would know where the sheets are but I can't find them," he says, "She always took care of things like that." He takes a moment to sit and be silent away from the crowd. "I suppose I will have to learn to cook for myself too," he says, " I have never cooked for myself, not since we were married." I have to admit that I had the same thought. Throughout our conversation he repeats, "We will remain without her. We will remain without her." Perhaps a kind of reminder to himself. I ask if I may spend Old Christmas with him. "Of course," he replies, "Poftim la noi." You are welcome to visit us. Then, "No, not 'la noi'," he remembers, "It is not 'us' anymore. It is just me." "Surely there are things that I forget to mention…" Nina muses, "[I wonder if I can] ever remember everything..."
Nina and Pasha's stories shows that these memories are dying before our eyes. We must capture them. We must listen. We must show these victims of extreme injustice that we see them, that we hear them and that we believe that what happen to them was wrong. Only we can show these former deportees that we care and that their lives, despite the oppression, hardship and shaming that they faced, is important and means something, something deep, something utterly human.